Shade-loving choice that is extremely hardy, versatile and easy to grow. 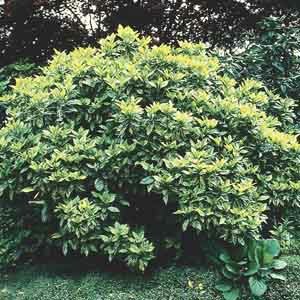 An upright shrub with evergreen leaves that thrive with little attention needed. A real standout in heavily shaded locations! Beautiful in shady borders and woodland gardens. A great choice for foundation plantings or hedges. Excellent for planting along fences and walls. Easy to grow! Adapts well to a range of soils with excellent drainage. Water regularly until established. Prune back early each spring for best display.